Rabbit polyclonal antibodies were produced by immunizing animals with a GST-fusion protein containing the N-terminal region of arabidopsis thaliana MPK6 (AT2G43790). Antibodies were purified by affinity purification using immunogen. Fig 1. 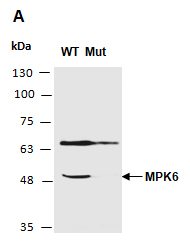 Western blot analysis of equal amounts of protein extracts from wild type (WT) and Mpk6 deficient mutant (Mut) arabidopsis leaves, using anti-MPK6(N) (R3451-1) at RT for 2 hr.